Heat oven to 400° F. Generously grease pie plate, 9x1 1/4 inches. 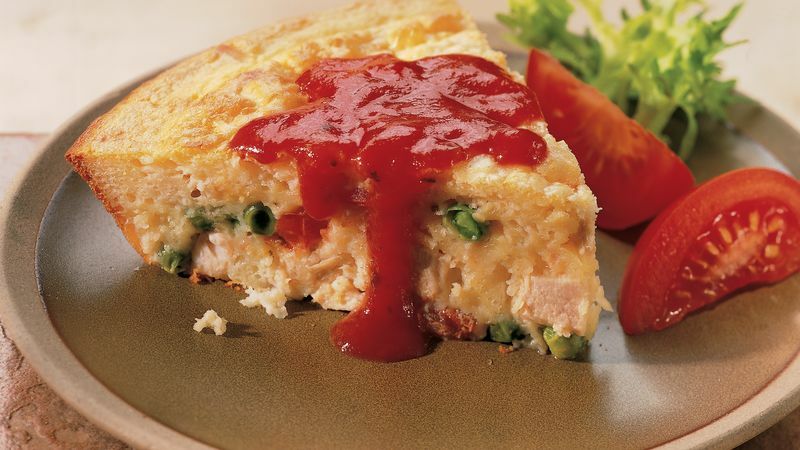 Mix chicken, tomato, peas, cheese and Italian seasoning in pie plate. Stir baking mix, milk and eggs with fork until blended; pour into pie plate. Bake uncovered about 35 minutes or until knife inserted in center comes out clean. Serve with pasta sauce, if desired. If you have Bisquick Original baking mix at home, you may go ahead and use it in place of the reduced-fat baking mix. A crisp green salad with tomato, cucumber and sweet red onion would be a nice complement to this savory pie.